We really do need to take you outside. Well, yes, sweetie, it is, but it’s not a heavy downpour. But it IS still raining. Yes, but you REALLY need to go outside. This morning you just stood in the doorway and refused to go out. Of course I did. I don’t like the rain. And I don’t poop in the rain. Or pee. In the rain. You must be ready to burst. I can hold it. I’m not going out in all that wetness. We’ll just go out with your new raincoat on then. Give it a try! I’m not punishing you. I’m concerned about you. You haven’t even stepped outside since last night. But I DID step outside this morning! It was raining so I stepped right back in. I stand corrected. But we’re going out now. We’re going to walk down the street together, and stop looking so sad in that raincoat. It’s not the end of the world. You need to poop and pee and that’s all that’s going to be said about it. I’ll walk in that dreadful coat but you can’t make me poop and pee. I don’t do that in the rain. OMG, that’s hilarious! 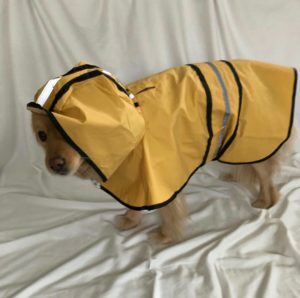 Nice raincoat, too!